1. The cheetah, which can run as fast as 70 miles per hour, is the fastest land mammal on the planet. They can go from 0 to 60 mph in only three seconds, which is faster than many sports cars. 2. Cheetahs can outrun racehorses by a difference of more than 20 mph. 3. The main prey for cheetahs includes impalas, gazelles, warthogs, small antelopes and game birds. 4. Cheetahs use their tails as a type of “rudder” while they are running. It helps them steer into the direction they want to go, much like a rudder does for a boat. 5. The mortality rate of cheetah cubs in the wild can be as high as 90 percent. They are often attacked and killed by other animals, including hyenas, lions, and baboons. Even in captivity, the mortality rate is about 20 percent before they even reach one month old. 6. In the wild, cheetahs typically live to be between 10 and 12 years old. In captivity, they can live up to 16 years old. 7. There are an estimated 10,000 to 12,500 cheetahs living in African countries today with the majority of them – about 3,000 – living in Namibia. 8. Cheetahs can mate at any time throughout the year. The gestation period is about three months and the average litter size ranges between two and four cubs. 9. To kill their prey, cheetahs will knock the other animal to the ground and bite it on the neck to kill it. They have to eat the prey quickly or else other animals that are more aggressive will come and take it away. 11. The black streaks found underneath a cheetah’s eyes help reduce the glare from the sun. 12. Cheetahs measure between four and five feet long, but their flexible spine helps them reach a stride that measures up to 20 feet. 13. When cheetah cubs reach 18 months old, the mother leaves them to be on their own. The cubs typically stay together with its siblings for about another year. At that time, the female cubs will go out on their own and the male cubs will stay together for awhile. 14. 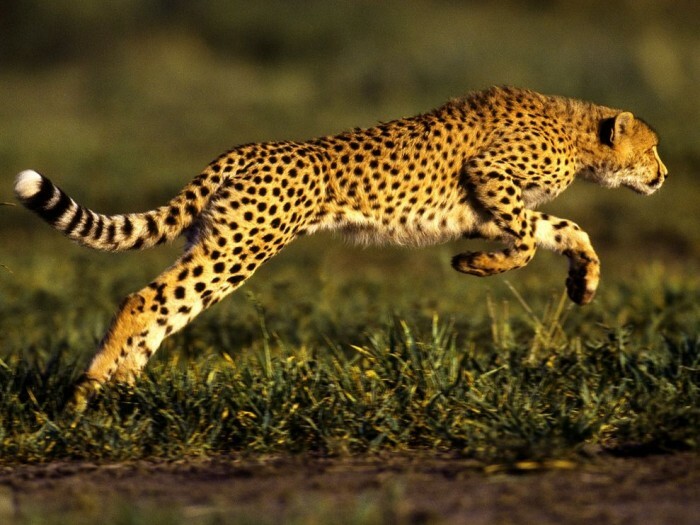 At full speed, a cheetah can only run for 400 to 600 yards before becoming exhausted. When they are too tired, they become vulnerable prey to other animals. 15. In the 14th, 15th, and 16th centuries, royalty from China to Europe owned cheetahs as pet-like animals. They would often take their cheetahs hunting for sport. 16. While sprinting, a cheetah can change direction in midair. 17. Although cheetahs cannot roar like a lion or tiger, they make a bird-like sound, referred to as a “chirrup,” when calling other cubs. They can, however, growl, snarl, purr and make other sounds. 18. Cheetahs rarely need to drink water because they receive most of the moisture that their bodies need from the prey that they kill. 19. Fully grown adult cheetahs weigh between 75 and 145 pounds. They measure between two and three feet tall from the ground to their shoulders and they have a tail that measures about 30 inches. 20. The cheetah is listed on the list of vulnerable species for the International Union for Conservation of Nature. 21. There are 36 known species of the cheetah. 22. In comparison to a lion, a cheetah’s heart, lung, and liver are three times as big. 23. A cheetah’s body contains between 2,000 and 3,000 spots. 24. Cheetahs have a keen sense of sight. They can see things from three miles away. 25. To avoid a fight, a cheetah will give up its killed prey if a larger and more aggressive animal approaches them. 26. Female cheetahs live solitary lives except for the times when they are caring for their cubs.